This mid week meal is simple to make and full of flavour. Preheat the oven to 200oC/gas mark 6. Lightly grease a baking tray with a little oil. Place half the butter in a small bowl with the garlic and basil and mix together to form a paste. Cut a deep slit into each chicken fillet, then stuff with the garlic herb butter. Place on the greased baking tray and cook in the oven for 30 to 40 minutes, until the chicken is completely cooked through. Line another baking tray with non-stick baking paper. 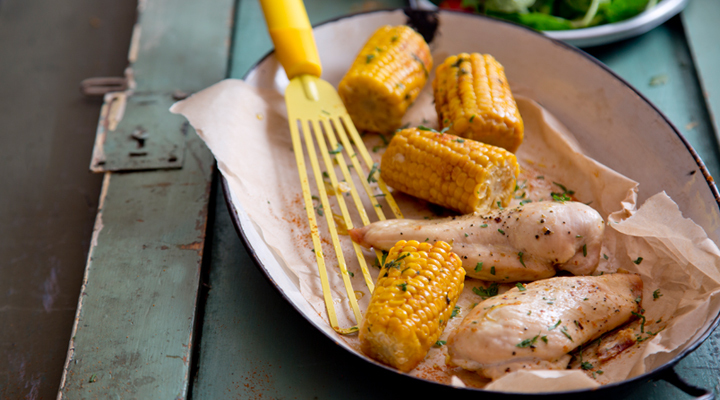 Place the corn on the tray and cook in the oven with the chicken for 20 to 25 minutes, until cooked through. Melt the remaining butter in a small pan, then mix together with the parsley, garlic and chilli powder. When the corn comes out of the oven, drizzle the butter over each cob. Place the salad leaves, cherry tomatoes and cucumber in a large bowl and toss together to combine. Serve the chicken with the corn and salad on the side. Tip: You can barbecue the corn on the cob until it's nicely charred, then season with salt and a squeeze of lemon juice.